To celebrate the end of a long and stressful legislative process for the debt talks, President Obama took some members of his staff out for lunch on Wednesday. 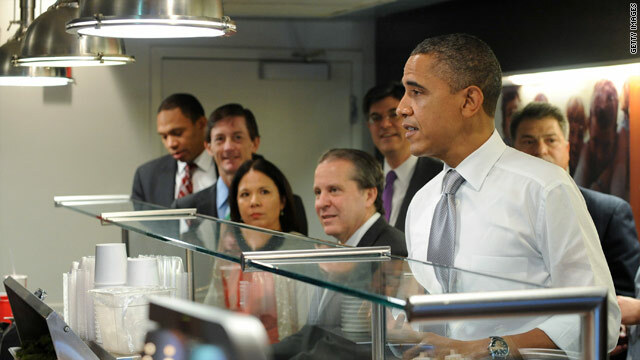 The president, along with 5 of his staffers, dined at Good Stuff Eatery, a hamburger joint on Capitol Hill known for its burgers, fries, and milkshakes. Obama wanted to thank the team for their nonstop work for the past few months on the debt negotiations. The group went into the restaurant, run by Spike Mendelsohn of Top Chef fame, and ordered burgers and fries. No word if he ordered a "Prez Obama Burger" which is a burger topped with "applewood bacon, onion marmalade, Roquefort cheese, and delicious horseradish mayo sauce," according to the restaurant's website. The staff members- OMB Director Jack Lew, Legislative Affairs Director Rob Nabors, Deputy Chief of Staff Nancy Ann DeParle, Chief of Staff to the Vice President Bruce Reed and Director of the National Economic Council Gene Sperling along with the president sat upstairs and greeted other patrons during the unannounced trip away from the White House campus. Talk about ignorance of literature. The 'tar baby" comment is complete appropriate. It has no meaning in racial terms. Careful there, that sounds like a heart attack on a bun....enjoy, and Happy Birthday.